The Catholic Mass is a remembrance of Christ’s victory over death and His promise of salvation. Mass Cards from the Maryknoll Fathers and Brothers are a beautiful way to remember a loved one in prayer, and to ask for God’s blessing. 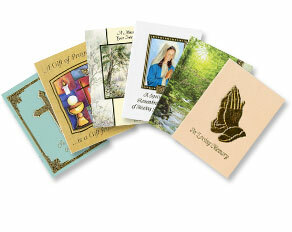 Spiritual Enrollments are perpetual gifts of prayer for loved ones, living or deceased. Maryknoll Fathers and Brothers will remember the person you wish to honor at Mass, when we pray the Rosary, and through our apostolic works. Prayer connects us to God and one another—with prayer, we are never alone. Your offerings will support the life-giving mission work of Maryknoll overseas and in the U.S, for over 100 years serving the poor and marginalized around the world.